Moving is a complicated and tricky task. Packing and moving your goods and belongings to a different place need meticulous planning and boundless patience. The complexity of the whole process adds to the mental and physical distress. From planning to packing until you are settled at the new place, we provide end-to-end services. While many believe DIY move as a cost-effective one, it is packed with numerous issues and problems. Therefore, hiring professional movers is the best way to cut stress. 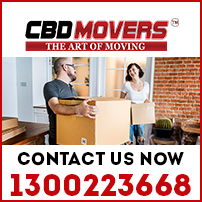 At CBD Movers™, we are the best professional movers in Melbourne. Our top-rated removal services are genuinely priced and very reasonable. A one-stop-shop for all your removal needs, we have proficient staff, high-end trucks and best-in-line equipment to register a successful move. At CBD Movers, we provide the widest range of removal services. Our exclusive services and outclass execution with the lowest prices; make us the most preferred movers in Melbourne. We understand that no two clients are the same. Thus, we provide customized solutions to meet the requirements and budget in full. Our ‘Movers & Packers’ team is expert at performing comprehensive house and office removal tasks. Our ‘Two Movers & a Truck’ team is apt at shifting one-off items like pool tables, pianos, heavy couches, etc. with dexterity. At CBD Movers, we use the finest packing material and adopt the best packing techniques to provide maximum protection to goods during transit. Our services are not restricted to any border. We hold all the necessary licenses and undertake local, interstate and international removals without any legal hassles. We own a huge fleet of trucks and have a well-established network that assures a safe and quick relocation. At CBD Movers, we are the cheapest movers in Melbourne. Our policy to slash every written quote by 10% makes our rates the lowest in the region. We also offer an overall transit insurance cover that protects and safeguards goods against any damage during transit. Our deals are transparent and we have no hidden clauses. Preston, a suburb of Melbourne, Victoria, Australia, is 9 kilometers north of the Melbourne Central Business District. Spread over an area of 11.3 square kilometers, Preston is home to nearly 30,000 people. A quiet and peaceful suburb packed with all amenities, Preston offers a comfortable living. 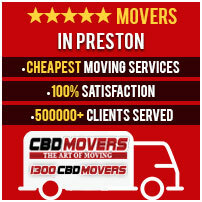 At CBD Movers, we offer excellent removal services to the people who wish to move to and from Preston with ease and competence. Our services are safe, time-bound and affordable. For any inquiry or to get a free quote, call us at 1300 223 668.